The famous Swiss company Bell & Ross has announced the release of new models of PW1 and Vintage WW1 Argentium, which are used to create the clock time of the First World War: PW1 pocket watches and wrist watches Vintage WW1. Two models PW1 and Vintage WW1 Argentium performed using a new alloy – argentiuma, very resistant to oxidation. Pocket watches PW1 Argentium modified elegant complication – minute repeater, display time by performing a musical melody by the user. Fixed time interval, in low tones, but every 5 minutes, we hear high and low double sounds. Installed on the left side of the body provides the key musical function. Round body model PW1 Argentium, made of argentiuma is 49 mm. Anti-reflective sapphire crystal protects the dial of ruthenium, radiant patterns decorated with applied indexes and numerals of metal. Clocks operate on the basis of the mechanism of Dubois Depraz with manual mechanism and a 56-hour power reserve. Water resistant up to 30 hours meters. Model comes in an elegant silver chain. Model Vintage WW1 Argentium has a body made of argentiuma 41 mm with water resistance to 30 meters. 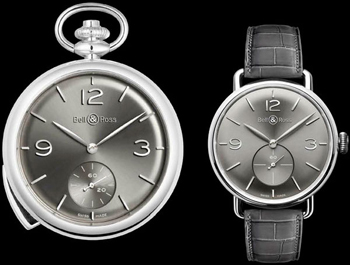 Dial, sapphire glass, topped with anti-reflective coating, decorated with ruthenium or silver finish. The clock is based on the Swiss movement ETA Peseux 7001 manual winding, which provides an indication of hours and minutes. Small second indicator is set to dial at 6 o’clock position. Supplied model alligator strap gray, pin-equipped buckle of argentiuma. Buy watches PW1 and Vintage WW1 Argentium can be the official representatives of Bell & Ross.